Lily, Step away from the printed shirts... Seriously I need to stop. I find them so tempting at the moment I can't resist buying them! This Zodiac one from ASOS caught my eye as I thought it was really different and unique. Plus it's not see through which is my pet hate when it comes to shirts! Although yesterdays shirt was the exception to the rule! I know I seem to wear the same stuff at the moment and Im well aware it's boring a lot of people but I think Ive gone into a unintentional style rut that unfortunately I quite like! I think I always seem to go through little phases of liking specific things before moving onto the next obsession! A massive restock of JWLRY has come in so there is free WORLDWIDE shipping for the next week! The discount should be taken off at the checkout automatically, but if there are any problems let me know! The usual deals are on three of the small rings for £8 and for the next week you can get 5 small rings for £12 handpicked by yourself, using the code "5MIX". Just add 5 rings to the basket and apply the code and it should discount it appropriately! 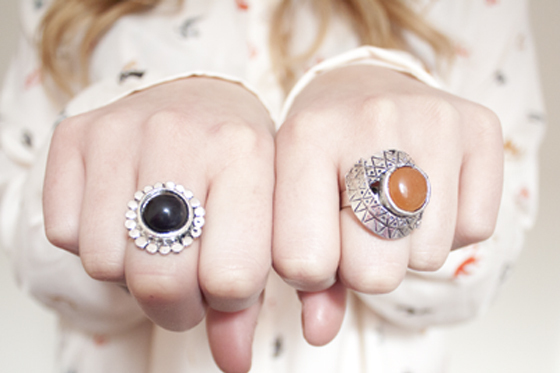 The random five for £10 deal is also back with a variety of large and small stoned rings. Let me know if there are any problems, Big Cartel is a bit glitchy at the moment! so much love for that printed top! i'm going to pop over to asos to see if they have it in my size! ah, you have the cutest shirts ever!! seriously!! Love the rings and the blouse! Great purchase dear, is totally lovely!! Moreover you combinated perfect with the rest of the accesories. in love with all your jewellery! I have SO many printed chiffon shirts... it takes up most of my wardrobe, I'm like..."Dayner, you have no clothes for your bottom half goddammit!" lol but they just make you look so smart and polished I think! Looks really nice. I love that you're taking the fur into the Spring too! it's gorgeous! haha, i hate it when shirts are see through too! I'm tempted to buy this too! its ridiculously cute! Wow, I must get that shirt! Can't stand the see through ones either! You have the most gorgeous collection of shirts Lily I swear! I love the fur, can never seem to find anything even vaguely similar! I have an everlasting love for printed shirts, too. Your Kodiak motif one is super cute. Hey! que linda blusa! lindo outfit! always love your hairdo! <3 its great! 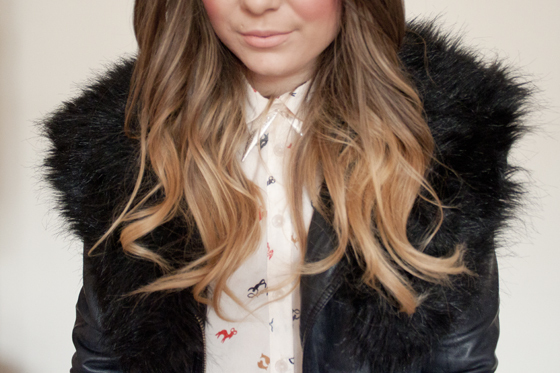 I really need to shop at ASOS because I'm falling hard for the printed shirts! If you like them, flaunt them off girl! Oh boy, that shirt is INSANE. Insane good. I adore it. It's so playful! Love the colours. Your hair looks amaaaazing, by the way. Wish I could get mine to stay that way. It will for about 10 minutes, then I step outside and POUFF - giant mess. I love the bracelet and the shirt! I always love your outfits! Oh wow, that shirts amazing! You are rocking the bracelet Lily, looks great on you! Love the shirt AND the bracelet AND the necklace AND... Do I even need to say more? Hopefully will bump into you again soon. Maybe at the Motel event? thanks! Im not sure if Im going to go as it was a bit busy last time and I felt a bit overwhelmed! I'm not very good in small spaces with lots and lots of people! feel a bit claustrophobic! 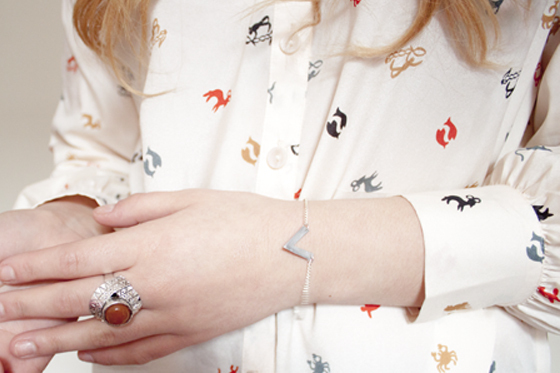 love all the printed shirts at the moment! Really love the shirt, have to agree about the sheer/see through ones though, it was a nice touch at first but its a bit tiring now at times. Hate taking away from the look having to put something underneath! Would you say it came up big/small or true to size? ASOS can be so hard to guess but I love this shirt, had my eye on it for a few days now. 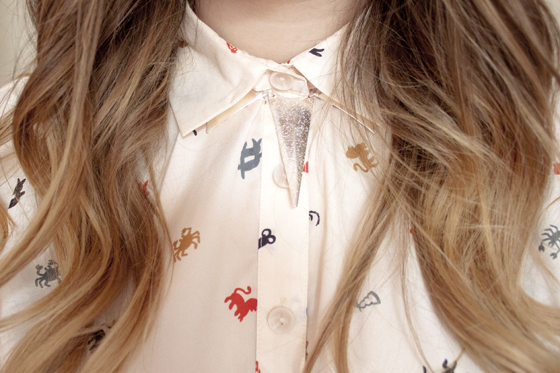 Printed shirts are the best kind of shirts - I love it! The photography is great and I love the shirt! I love this shirt, I've not seen it on there.